In a world of 24-hour media saturation, sleep has become an increasingly fraught enterprise. 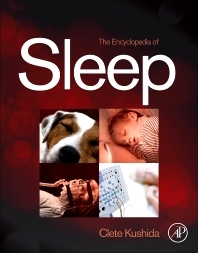 The award-winning four-volume Encyclopedia of Sleep is the largest reference, either online or in print, on the subject of sleep. Written to be useful for the novice and the established researcher and clinician, Topic areas will include sleep across the life cycle and in other species, sleep and women, sleep and the elderly, pediatric sleep, sleep deprivation and loss, sleep mechanisms, sleep physiology and pathophysiology, sleep disorders, neurobiology, chronobiology, pharmacology, and impact of other disorders on sleep. Recognizing the many fields that are connected to sleep science, the editorial team has been carefully chosen to do justice to this highly interdisciplinary field of study. The steady growth of researchers and clinicians in the sleep field attests to the continued interest in the scientific study of sleep and the management of patients with sleep disorders, and anyone involved in this exciting field should find this work to be an invaluable reference. Why Do Infants Sleep So Much? Why Do Infants Twitch So Much During Sleep? Sleep-Like States in Other Organisms: Do All Animals Sleep Like Humans? Is Sleep Vital for Memory Consolidation? What Treatments Optimize Sleep in Children with Sleep Problems? Introduction: What Is a Dream? Why Support the Aging Sleep–Wake Rhythm? Would Support to Enhance the Sleep–Wake Rhythm Be Profitable? How Can the Sleep–Wake Rhythm Be Supported? Is Sleep for the Brain? Is Sleep for Cerebral Energy Restoration? Is Sleep for Synaptic Homeostasis? Is Memory Consolidation a Function of Sleep? What Is It About Wakefulness That Causes Increased Propensity for Sleep and Enhanced SRS Levels? Why Are Rating Scales Used to Assess Sleep Disorders? How to Choose a Rating Scale? Background: What Is Public Policy? How Does Insomnia Become a Comorbid Condition? Why a Behavioral Approach for Treating Chronic Insomnia Should Be Considered? Who Uses Adjunctive and Alternative Treatments for Insomnia and Why? Is Complex Apnea a Trait or a State? What Is Screening and How Is It Different from Case Finding? What Provokes Parasomnias in Children? Which Patients with Stroke are More Likely to Have Obstructive Apnea? What Apnea Subtype Occurs Poststroke? How are Patients Able to Tolerate CPAP After Stroke? Clete A. Kushida, M.D., Ph.D. is a neurologist who is a professor in the department of Psychiatry and Behavioral Sciences at the Stanford University Medical Center, medical director of the Stanford Sleep Medicine Center, and director of the Stanford Center for Human Sleep Research. He is president of the World Sleep Federation, past president of the American Academy of Sleep Medicine, and founding president of the California Sleep Society. He has conducted basic and clinical sleep research since 1977, has served as principal investigator for numerous federally and industry supported research studies, and has authored or edited over 150 publications, including six books.